Base Notes: cedarwood, moss, musk, amber 1962 Eau de Parfum is a fragrance of unbridled affection to an era of love, modernism and evolution. In the summer of 1962, music, art and colour had driven Soho into a world of its own, where coffee bars and rock clubs held court. Visiting London for the first time in 1962, the smells of spices, herbs and fruits welcomed your arrival into the city's bohemian quarter. Beautifully boxed; 100ml natural spray. Made in England. South of Carnaby Street, Soho - Summer 1962. 'A gentle touch of effortless affection, a memory of being in love and holding the future in our hands'. 1962 Eau de Parfum is a fragrance of unbridled affection to an era of love, modernism and evolution. In the summer of 1962, music, art and colour had driven Soho into a world of its own, where coffee bars and rock clubs held court. Visiting London for the first time in 1962, the smells of spices, herbs and fruits welcomed your arrival into the city's bohemian quarter. Vibrant notes of effervescent bergamot and zesty green mandarin with herbal hints of basil, spearmint and spice lead to a warm, powerful heart of cypress and jasmine. Base notes of cedarwood, moss and musk with amber create longevity and a woody undertone, which develops early and sustains the fragrance. FROM THE FRAGRANCE JOURNALS COLLECTION: The Fragrance Journals are a series of three unique Eau de Parfums, capturing the heart and soul of London throughout the decades of the 1960s, 1970s and 1980s. Each fragrance weaves and knits its way through the fabric of a key moment, district, and culture of the time, bringing out a true reflection of a city which has the ability to both adapt to change, yet remain rooted in its identity. A love letter to London, its social fabric and its people. 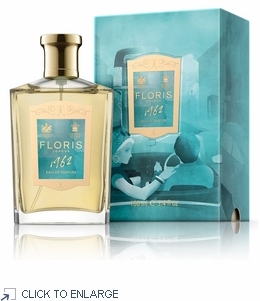 1962 Eau de Parfum is a fragrance of unbridled affection to an era of love, modernism and evolution. In the summer of 1962, music, art and colour had driven Soho into a world of its own, where coffee bars and rock clubs held court. Visiting London for the first time in 1962, the smells of spices, herbs and fruits welcomed your arrival into the city's bohemian quarter. South of Carnaby Street, Soho - Summer 1962. 'A gentle touch of effortless affection, a memory of being in love and holding the future in our hands'. Vibrant notes of effervescent bergamot and zesty green mandarin with herbal hints of basil, spearmint and spice lead to a warm, powerful heart of cypress and jasmine. Base notes of cedarwood, moss and musk with amber create longevity and a woody undertone, which develops early and sustains the fragrance. Each fragrance weaves and knits its way through the fabric of a key moment, district, and culture of the time, bringing out a true reflection of a city which has the ability to both adapt to change, yet remain rooted in its identity. A love letter to London, its social fabric and its people.